Brutus is a 13 year old male neutered Domestic Short Haired cat. Brutus has a history of coughing for 3-4 weeks. He has lost some weight and stopped eating ~3 days ago. On physical examination he is thin, with wheezes and crackles auscultated over all lung fields. 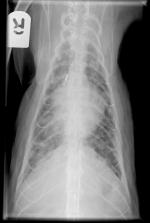 What type of lung pattern doesn Brutus have? What are your differential diagnoses?